This page has two sections, the first is a gallery of your Astro Images. Please Email us your images at sales@harrisontelescopes.co.uk and we will publish as many as possible here. The second section invites you to send in images of your setup, this is especially useful for those seeking ideas on equipment and their configuration. We held a Galaxy S7 phone to the 4.7mm Meade eyepiece on our Vixen FL102 4" refractor on 14/09/2016, a nice image and very easy to do. 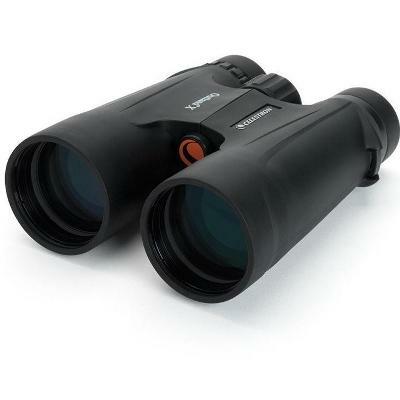 With a steady hand these images are probably the easiest way to get your first astroimages. 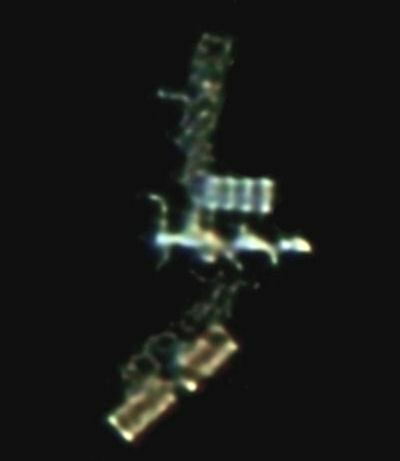 Derek took this amazing image of the International Space Station on the 15th July 09 with a Meade LX90 8" SCT Telescope using a Canon 350D DSLR Camera. A 4" spacer combined with a 2x Barlow lens allowed the image scale to reveal this fantastic detail. 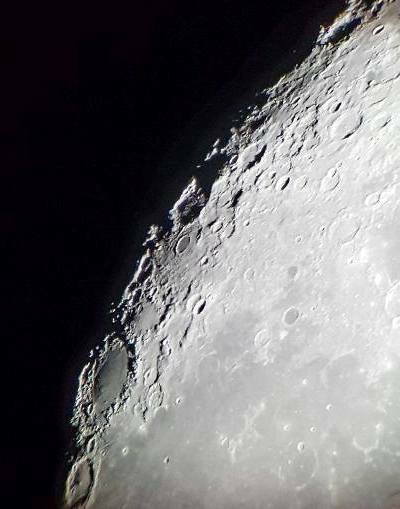 Roger took this superb Lunar image through the SkyWatcher Equinox 80 Apo mounted on an HEQ5 with a DMK31 camera and 2x Barlow lens. 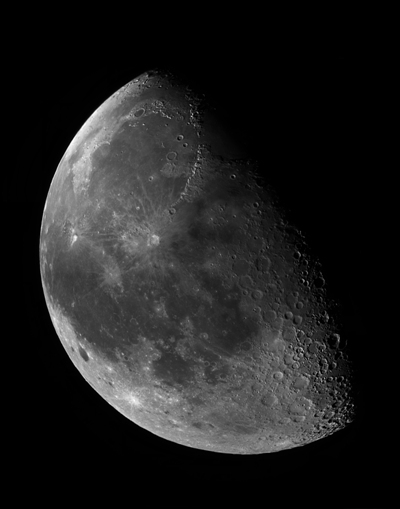 Roger combined 14 stitched images to produce the fine Lunar mosaic. 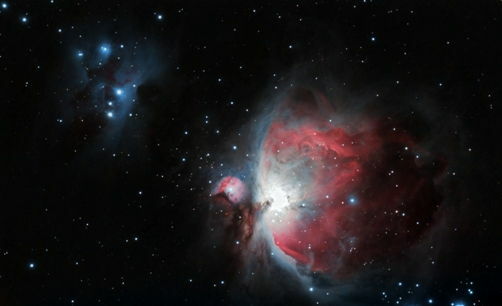 This image was taken using the equipment at Caradon Observatory. An hour long series of 3 minute exposures was used to take this image through a 120mm telescope (supplied by Harrison Telescopes) with a standard digital SLR (Canon EOS 450D). 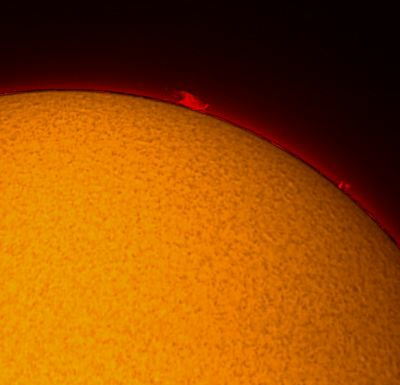 Roger took this fine image of our closest star - the Sun with a Coronado Personal SolarTelescope and his DMK31 camera, a 2x Barlow lens was used to provide the correct image scale, prominences on the Solar limb can clearly be seen. 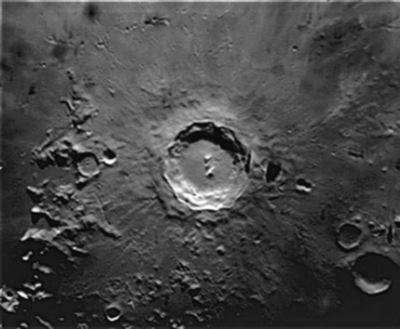 This image of the famous lunar crater Copernicus was taken with a SkyWatcher Explorer 130P SynScan telescope, Shaun used a 4x Barlow to get this close up showing a great deal of detail. 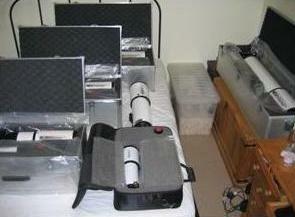 I have been the proud owner of a TEC 200mm Fluorite Refractor since 2001. 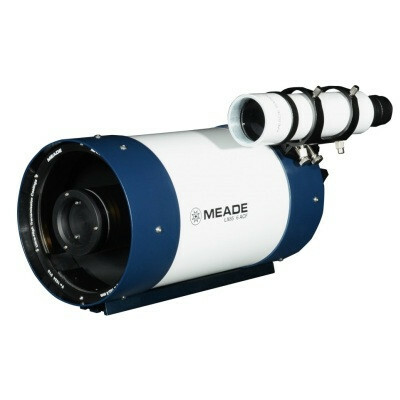 This is the only instrument of it's kind in the UK, and I have christened the telescope Phoebe. Ted Harrison has played a major part in Phoebe's history, and I have always referred to him as "Phoebe's Godfather"! 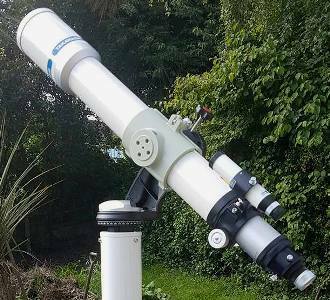 Whilst the telescope, which is in fact the TEC prototype, was under construction, Ted installed an 8 foot Sky Dome in my garden in Stapleford Abbotts in Essex, in preparation for the arrival of the telescope. On Phoebe's arrival in September, 2001, Ted applied the necessary mechanical refinements to enable the telescope to be mounted within the dome on an early Astro -Instruments PM1 mount on a pier. He also added a sliding weight mechanism to Phoebe's main tube to facilitate a fine balance when using heavy eyepieces. It was shortly after this that I noticed, to my horror, that the star images had become diamond shaped. Ted's optical experience enabled him to quickly ascertain that this was the result of "pinching" by Phoebe's complex lens cell following the move to a less damp environment. He quickly rectified the problem via delicate cell adjustment and has serviced the instrument again since. Such expertise with dome installation and with a large and rare apochromat amply demonstrates his skill as an engineer as well as in optical upkeep. Upper right is a picture of Phoebe inside the dome, below is Albireo imaged with a Canon 350D digital camera and lunar detail taken with a small digital camera held up to a 13mm Ethos eyepiece. Interested parties may write to me care of Harrison Telescopes. James is the privileged owner of one of the finest collections of premium apochromat refractors with no less than seven APM -TMB triplets from the 80mm through to the legendary 152mm F8. Each of these optical masterpieces are cared for like family members some of which boast strehl ratios in excess of the magic 99. In Xmas May 2002 I received my first telescope, the 130mm SkyWatcher reflector, this was a self promise on the back of a childhood dream to one day be able to afford my own telescope. From observing the Moon through this instrument for the first time I was hooked. 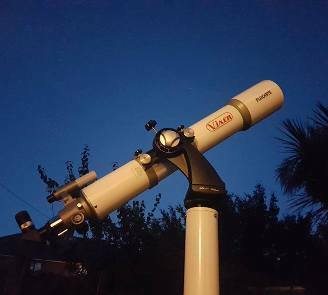 Within months I had the privilege of owning the 6" SkyWatcher achromat refractor, Meade ETX90, LX200 8" & 12" and in all cases have been humbled by the experience and ownership of these fine instruments. From personal preference I always dreamed of owning a 6" apochromat but with so much information out there I was completely lost, I guess from a financial standpoint it had to be the right decision due to the cost of these types of instrument. Through the retail avenue I made contact with Astronomy enthusiasts and this included Ted Harrison. 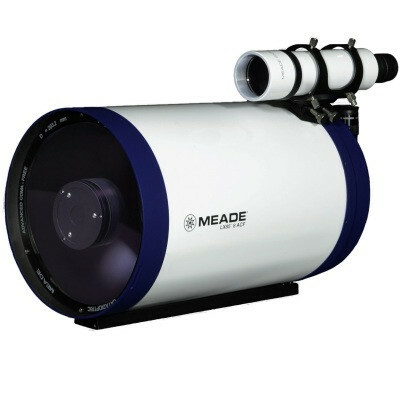 With his wide and long standing experience in the field of using astronomical instruments, his experience in the field of telescope engineering (in repairing some of the most advanced computerised and complex optical systems to his retail experience in astro equipment) made him the perfect person to help and advice. This led to the purchase of the 6" F8 APM - TMB apochromat refractor giving views I can only describe as sublime when looking at Planets with these optics. This chance meeting with Ted who I now consider a dear and trusted friend, supported by Ted's long standing contact with Markus Ludes of APM who's collaboration with the late legendary optical designer Thomas M Back has enabled me to own some of the finest apochromatic refractors in the world - period. We don't just sell telescopes - we use them, our latest addition is the limited edition Takahashi FC100-DL, it is a Fluorite Apochromatic refractor with a lens diameter of 100m at f9. 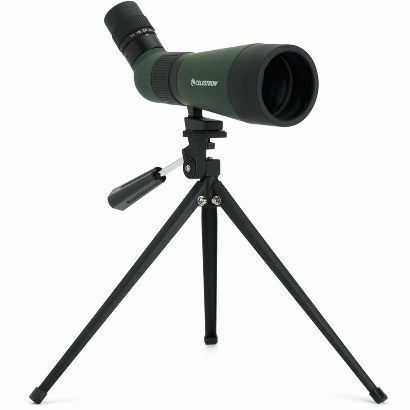 This fine instrument is the benchmark optic we use to assess eyepieces and accessories, allowing us to advise customers on the merits of literally hundreds of products. We actively observe regularly, the main interest is assessing instruments and accessories, star testing, and planetary observing. Our latest addition is this.wonderful classic, a Vixen 102mm Fluorite apo which again enables us to scrutinise new eyepieces, filters and accessories. 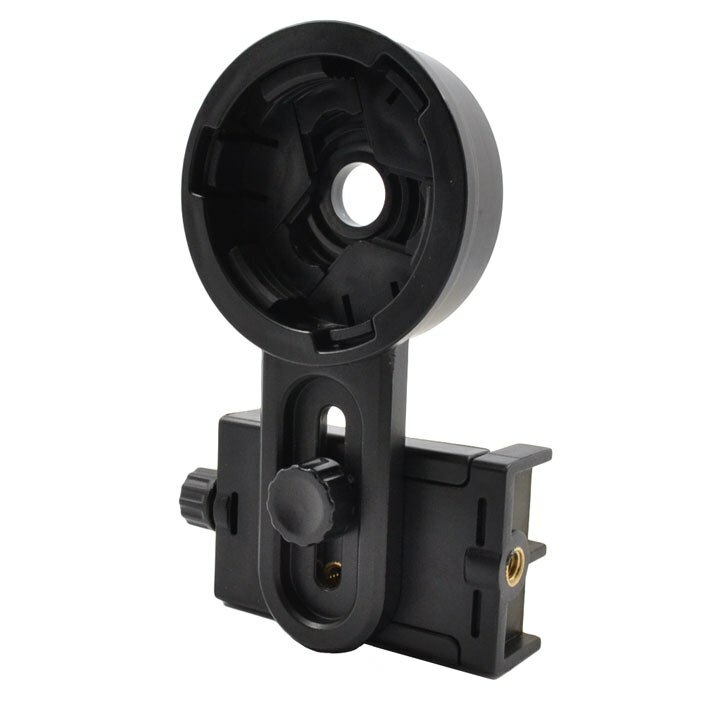 We have carefully re-blacked all the internal surfaces, reset, cleaned and collimated the lens and cell and stripped, lubricated and adjusted the focuser. Now in perfect working order this instrument optically provides images that are very hard to better - even in today's premium models. These instruments were produced in Japan in the 1980's when glass types now considered environmentally unfriendly due to heavy metal content could be used, the results are CaF2 combined with KzFN2 (unavailable nowadays) as the mating element enabled the optical designers to achieve superb corrections. Will age 10 done this logo for us!